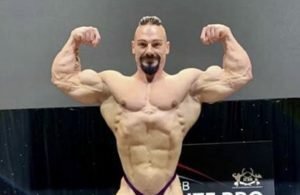 The saga regarding the 2018 Arnold Classic 212 winner Kamal Elgargni continues. 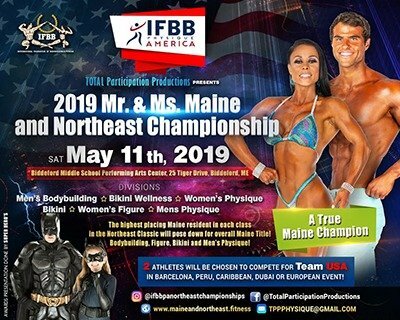 In days leading up to the contest in Ohio, during and after, Kamal insisted that nobody has presented him proof of his suspension from the International Federation of Bodybuilding (IFBB) or the Qatar-Anti-Doping Commission (QADC). 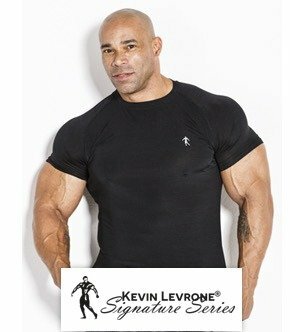 Evolutionofbodybuilding.net has obtained all the documents that prove Kamal’s suspension. 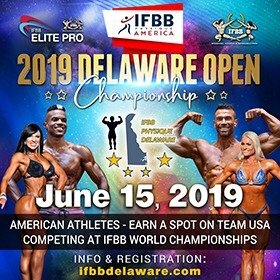 While the officials of the IFBB Pro League knew about the suspension of Kamal by the IFBB and the Qatar Anti-Doping Commission, they still took the decision to allow him to compete in the Arnold Classic Ohio. 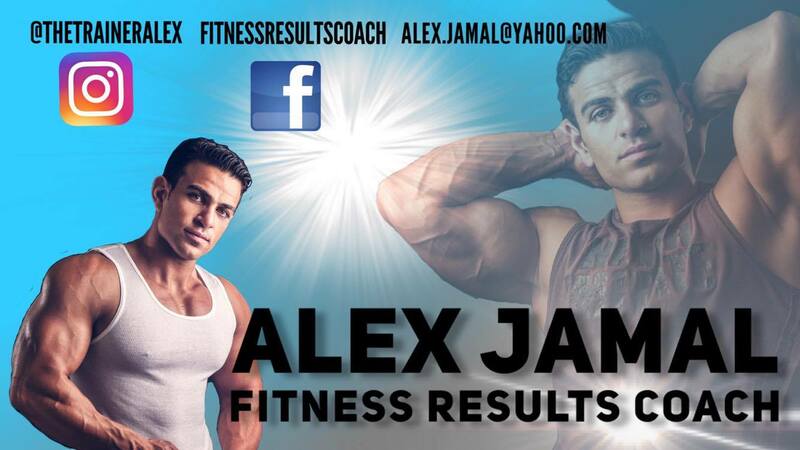 Another small but very important point about Kamal is that, Jim Manion did not give Kamal his first IFBB Pro Card. 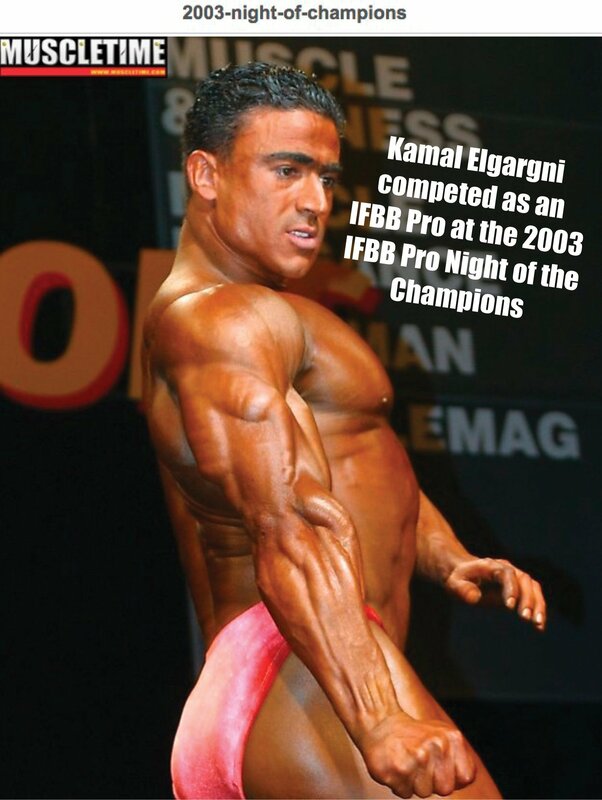 Kamal competed at the 2003 IFBB Pro Night of the Champions (see photo below) and did not place. He then decided to go back down to the amateur league. Not only did Kamal compete at the 2018 Arnold Classic, he won the 212 class and during his speech with Arnold Schwarzenegger, Kamal took the opportunity again to talk negatively about the IFBB. Arnold Schwarzenegger most probably did not know about the situation and obviously he did not know what Kamal was going to say. 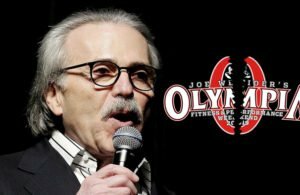 For a man with such a presence in the sport of bodybuilding, politics and as well the entertainment industry, Arnold Schwarzenegger surely would not have agreed to give a prize to somebody that is under suspension from the IFBB and the QADC. This surely would not sit well with other sport organizations in the USA. 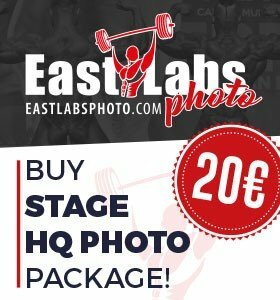 This truly goes against everything Arnold represents. Getting back to the suspension of Kamal. Kamal is suspended from 11 March 2014 to 10 March 2021. 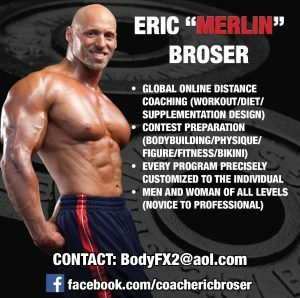 Evolutionofbodybuilding.net have obtained a number of documents that prove the suspension of Kamal. 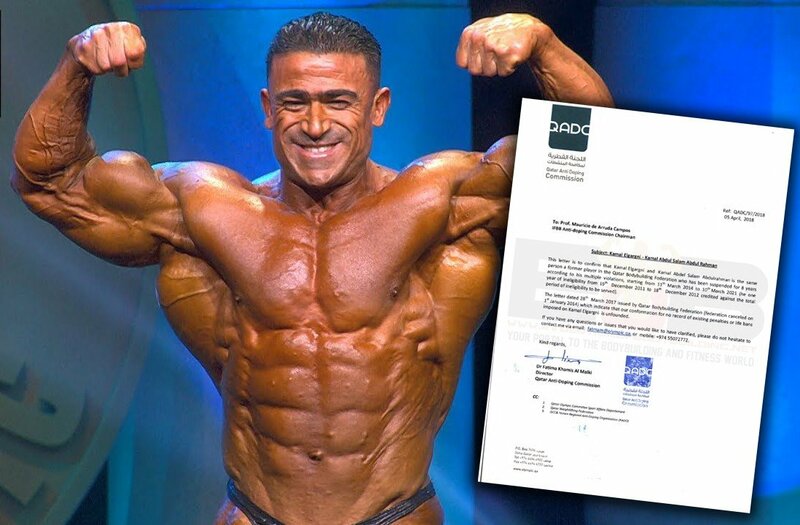 The letter dated 28th March 2017 issued by Qatar Bodybuilding Federation (federation cancelled on 1st January 2014) which indicate that our conformation for no record of existing penalties or life bans imposed on Kamal Elgargni is unfounded. 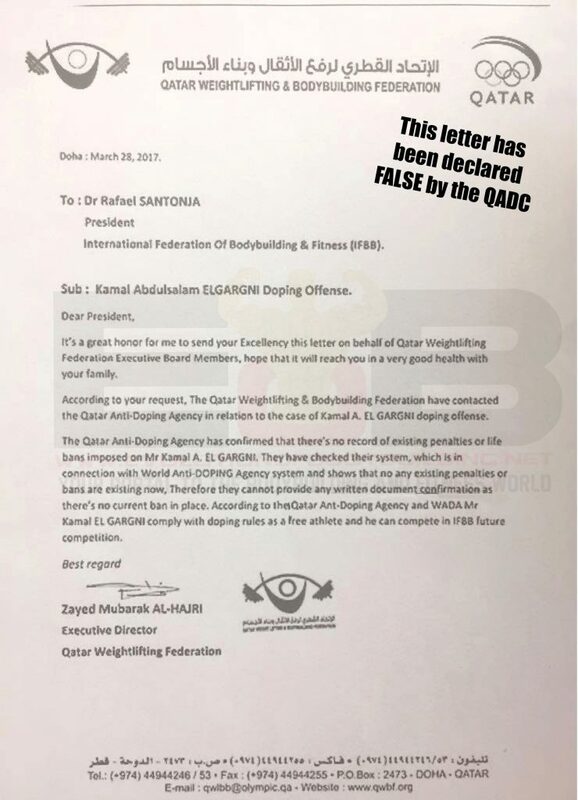 A suspicious letter (see attached) dated March 28 2017, by the Qatar Weightlifting and Bodybuilding Federation stating they have no record of Kamal’s suspension and he complies with the Qatar Anti-Doping Agency and WADA meaning he is eligible to compete with the IFBB in the future. The website associated with this letter (www.qwbf.org) does not exist. After Kamal’s comments in numerous interviews and even during his speech with Arnold Schwarzenegger, the Qatar Anti-Doping Agency confirmed in a letter dated 5 April, 2018 (see attached) to Prof. Maurico de Arruda Campos that the letter released on March 28 2017 is totally false. 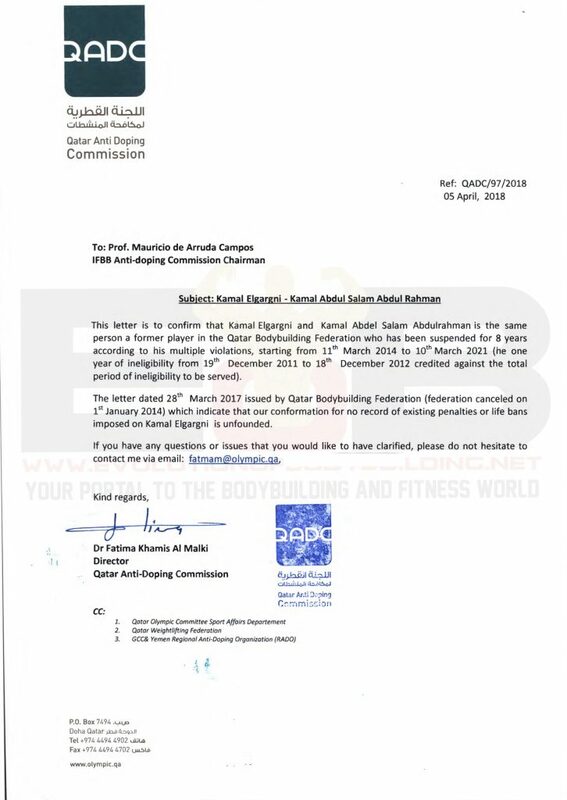 This letter is to confirm that Kamal Elgargni and Kamal Abdel Salam Abdulrahman is the sameperson a former player in the Qatar Bodybuilding Federation who has been suspended for 8 years according to his multiple violations, starting from 11th March 2014 to 10th March 2021 (he has one year of ineligibility from 19th December 2011 to 18th December 2012 credited against the total period of ineligibility to be served). Obviously after reading these documents that definitely show Kamal is suspended till 2021. The IFBB Pro League will insist that they do not abide with the rules of the World Anti-Doping Agency (WADA) so this means Kamal can compete. 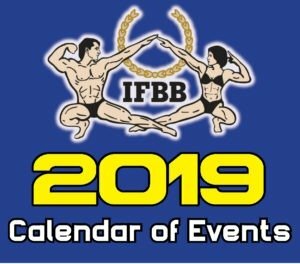 Kamal is competing in the same organization (IFBB Pro League) that has their president Jim Manion included in WADA’s ‘Prohibited Association List’ to manage sport as a consequence of his continuous violations of the WADA Code, disrespecting international sport rules. Jim Manion is also suspended till 10 October 2021. The official documents have been made public on WADA’s Official website. The publication date was 12 January 2018. What is disgraceful in all this is that, not only is it wrong letting a suspended athlete compete in a federation, but letting Arnold Schwarzenegger, who is one of the most respected and powerful people in the sport of bodybuilding hand an award to a suspended athlete without his knowledge has truly tarnished the sport and can have terrible consequences.